I'm back! You must have all been way too busy making Christmas cards to Play the Game last week (thank you to Yogi, Janet and Cheryl!) so I thought I'd better take another kick at the one-layer can and host OLW165. This week's challenge is to make a one-layered Holiday Card. With no red and no green. I made this simple card with two stamps, one inkpad and some stickles. See how easy? See how pretty? ETA, so that you can avoid your snow looking "like Tinkerbell vomited while walking backwards" (thank you Susan, for that enduring image!) - I 'drew' a line with the Stickles and then smudged it with my finger, to spread it out and make it look a little less like a line. And not because I needed to cover the rest of the sentiment (there's more on the stamp that sits under "Merry Christmas") that I had masked with tape, but it smudged anyway. Now you know all my secrets! embellishments to a minimum and NO ADDITIONAL layers of cardstock. 3. Post your card online and link it to the InLinkz button in the sidebar to the right. If you link to your blog, please link to the specific post and not your blogs main page. 4. HAVE FUN!! I can't wait to see what you create! The rolling snow and the touch of glitter on the trees is beautiful Ardyth! Gorgeous card, Ardyth! LOVE the snow...when I do that with Stickles, it looks like Tinkerbell vomited while walking backward. How did you get such a pretty layer of snow? Stunning Ardyth! Hopefully I will get a chance to play along this week! Hubby broke at least 4 ribs so my craft time has been limited and I NEED my craft time LOL. Beautiful! I love it when something fantastic comes from fixing a smudge. I'm loving the font on that sentiment. Where did you find that? Fab card, love the Stickle vomit snow! I had brain fade over Play The Game, but I'm planning to join this one. Love the frosty branches and snow drift. Beautiful CAS card. The subtle way you grounded the tree is superb. Absolutely fabulous! 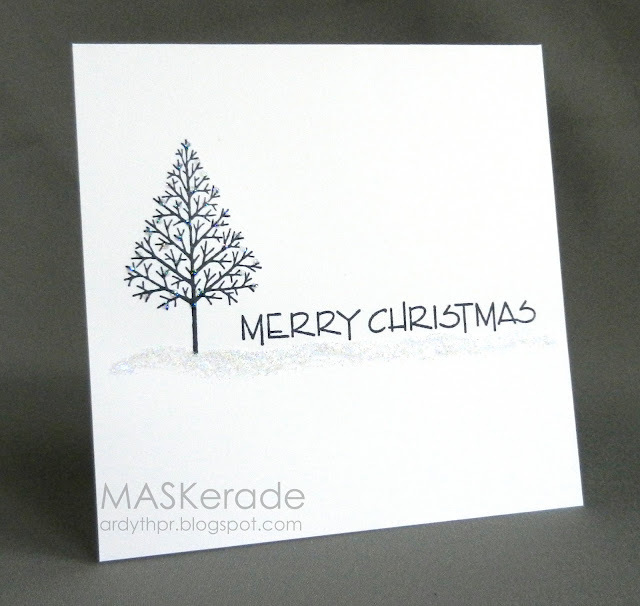 Love the clean, simple lines of the tree and sentiment, and the sparkle too! This is so perfectly designed and executed. You don't even miss the red or the green. Gorgeous card! I love your choice of gray with all that yummy white space and the stickles are the perfect touch! Thanks for sharing your secrets! What a great challenge and I'll never be able to look at stickles snow again without thinking about Tinkerbell ..... Hahaha!! Fabulous card...love the snow on the ground, so pretty. ..Tinkerbell vomit...definitely a lasting impression! Absolutely gorgeous! Who needs red or green when something as stunning as this can be created! Ardyth, I adore this card but I have to say I laughed to the point of tears when I read your comment about the Stickles (I'll never think of Tinkerbell the same way again!!! )!